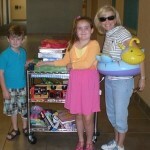 There are many different ways to fundraise for the Superhero Kids! Abby: A cancer patient herself, but now off treatment, decided she wanted to help the kids who are going through exactly what she did while she is on treatment. For her birthday, Abby asked friends to make donations to Superhero Kids. 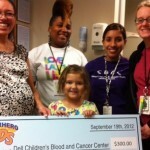 Teagan raised $1,000 after asking her friends in lieu of gifts to donate to the youngsters known as the Superhero Kids, who are patients of the Children’s Blood and Cancer Center of Dell Children’s Medical Center. 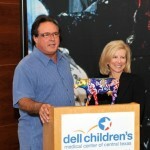 Each year Teagan’s birthday gift is even bigger, thanks to matching donations from Austin Philanthropist Milton Verret. 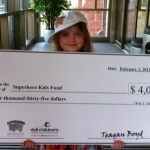 Teagan has raised a total of over $12,000 for Superhero Kids, and also was chosen as one of the KVUE 5 KIDS WHO CARE for her volunteer efforts! MacKenzie and Andrew: Elementary aged kids decided that instead of getting birthday gifts for themselves, they would rather get gifts and donate them to the children who are fighting cancer and blood disorders. Milton Verret: Austin Philanthropist Milton Verret purchased the Michael Jackson “Thriller” jacket at an auction with the intention of helping children’s charities by touring the famous jacket. Milton’s first of many gifts was the $100,000 donation to Superhero Kids that was arranged through the original owners of the jacket. Milton continues to support Superhero Kids through various endeavors and projects. Lance Letscher: Internationally renowned local artist, along with gallery owner, David Berman raised funds for Superhero Kids through sales of the limited addition children’s book, A Perfect Machine. 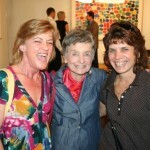 d.berman gallery also donated a portion of the opening night sales from Lance’s show of new works.